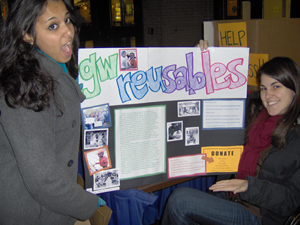 The Human Services & Social Justice Program at The George Washington University aims to promote and exemplify civic engagement and strengthen community well-being both locally and globally through ongoing reciprocal partnerships. The program accomplishes this by producing graduates who are knowledgeable, caring, and engaged human services scholar-practitioners in addition to creating and advancing new knowledge within the field. Furthermore, the program provides a broad and appropriate interaction with local human service projects as both a foundation of practical training and as an outreach to the University's urban neighbors. We build upon the foundation of empathy, concern for others and a commitment to social justice that our students bring to the program, providing the skills necessary to maximize these selfless qualities. Through our emphasis on continuous high standards of academic and scholarly excellence we ensure that our efforts will endure beyond matriculation and enhance any human service program involving GW's HSSJ graduates. The Interdisciplinary Student Community-Oriented Prevention Enhancement Service (ISCOPES) is a year-long interdisciplinary team service-learning experience geared toward providing a wide range of health-related services in Washington, DC. The beneficiaries of these services are often times underserved or uninsured individuals with limited access to healthcare, monetary resources, and whose language or literacy levels may prevent full involvement and acceptance in their communities.